Then who should you talk about? While I understand that he wants vendors to focus on the bride, not telling the brides about yourself is a big big mistake. Folks, if it’s not about you then it’s about price – and what would you rather compete on? Who’s cheaper? Or your youness?! In his presentation he expressed to the attendees that they should remove all references to themselves from their website and exchange it out for lots of phrases like “Phoenix brides”, “Atlanta wedding planner”, Wedding Photographer in the Austin area”, etc. so that the brides would “see themselves in your website”. Umm, hmmm….how can I put this gently – No, stop that crap right now! 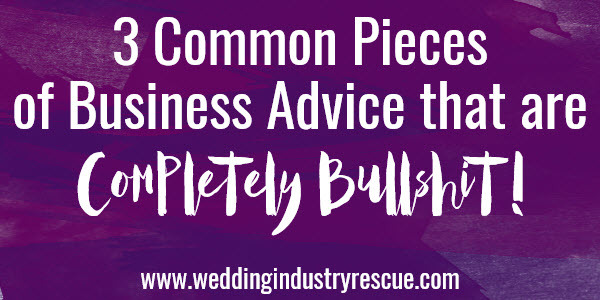 While I’m thrilled that you’ve learned to use a key word for SEO purposes, if a bride arrives at your website and your personality is lacking, they’re going to be headed on to the next person in the search engine line up! Your personality (your brand, your youness, etc) should be present in all that you do – and your website is no exception! On my own websites (both for Wedding Industry Rescue and our wedding planning business) is a picture of my husband and I. No shiny happy brides in site. Because the bottom line is that the bride is buying us and how we make them feel. You should totally research the hell out of your market and know the stats. You should know how many weddings are in your market. You should know how much they spend, what they are spending their wedding dollars on, what the customs, trends and styles of your market are, and just about every other stat involving your industry and your market. First and foremost this IS a business people! But the absolute most important thing you should know is how many of those people are actually YOUR bride! I don’t personally care how many brides are getting married in Austin this year. Because I’m not marketing to “Brides”. Let me repeat, I’m not marketing to Brides! *Last year of college or just finished. *Bride’s parents are paying the bulk of the expenses. *Careers – oil & gas work or attorneys. I can tell you a slew of other things about my market but this will give you an idea of what I’m driving at. You can see that with each item my list of people in my market grows smaller. Because now I don’t have to waste my time marketing to brides. I just take my time and market to my actual market. I can now spend more money per lead, but get the right kind of leads. Stop marketing to brides, start marketing to YOUR market. How old school is that?! I realize that the common teaching is that you should go out and price shop your competitors and then adjust your prices to meet your market. Or worse (and down right criminal if you ask me) price just under them. In that case, fine. Enjoy. Go out there and have a perfectly ordinary, ho hum kind of business that just blends in with everyone else. Go on about being nothing special. Oh! You don’t want that? Well in that case, go ahead being extraordinary! And charge extraordinary rates as well. Because if you decide not to be just a number you’ll be able to charge a hell of a lot more than everyone else. Because there is NO RULE for pricing. Gasp!! “But I just read like 3 books on pricing and they said…. ” um, to quote Pink, “So what, you’re a rock star”. I’m not a coffee drinker but I do remember that you used to be able to buy a cup of coffee for .25 cents. And then this crazy company came along and charged $3 or more for a cup of coffee. “Nonsense” people said. “No one is going to pay $3 for a cup of coffee. That’s not a sustainable business model”. And they were totally right, because that company went out of business – except they didn’t and you probably spent $4 on that Starbucks pumpkin spice latte you’re holding right now! Starbucks can charge you $4 for that latte because (and you can go ahead and admit it) you feel like someone special when you’re drinking it and when you’re holding that cup you belong to a special kind of club that doesn’t really exist. This imaginary feeling that warms your heart was all created to separate you from your $4. And you can create an equally beautiful scenario that lets you separate people from their $5,000, $10,000, or even more. You don’t have to charge what everyone else is charging. But you do have to create a scenario that elevates you above “the norm” to be able to attract those higher paying clients. We want to know – are you bucking the system and going against the traditional business advice and seeing results? We may even feature your story on our blog! Show A Little Personality (Or Some Leg). A Little Leg Never Hurt Anybody! Great post. I’ve heard this sort of advice recently. I guess if your looking for a generic and cookie cutter bride, then be cookie cutter. For myself, I’ll look for someone as weird and quirky as myself, Thank you. I absolutely love this blog post. I wish more photographers were passionate about who they would like to work with, as opposed to having super low prices and photo’ing almost everyone under the sun! Hmm I agree with most of this wholeheartedly. Thanks for being willing to share! Not sure what speaker said these things but doesn’t sound out of the norrm for our industry. There are a million different ways to think, do things, be… I personally do what I feel is best for me and my business not what someone tells me although I do like listening to all sides. Thanks for sharing your side. This is great information. I love the no-nonsense way this is written. I absolutely agree with the idea of letting who you are as a person and business owner come through in your blog posts. 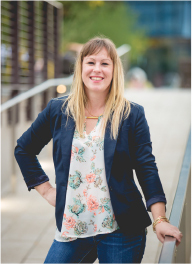 I want to set myself apart from my competition by showing my crazy fun side – and hopefully book crazy, fun brides. Great post. 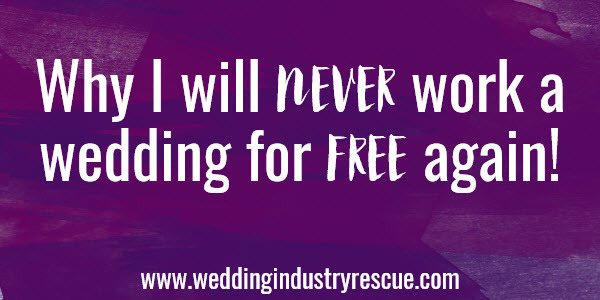 Why I will never work a wedding for free again!